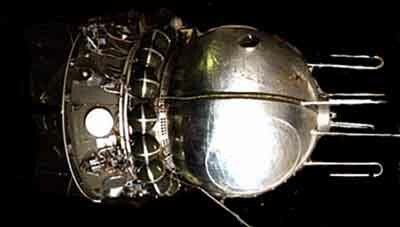 The Vostok 3K was the worlds first crewed spacecraft. Vostok 1, carrying Yuri Gagarin, performed the worlds first manned spaceflight on 12 April 1961. The Vostok capsule was developed simultaneously with the Zenit-2 photo reconnaissance satellite using a dual-use design, which shared many components. Vostok consisted of two modules: a spherical descent module of 2.3 meters diameter, weighing 2.46 t, which housed the cosmonaut, instruments and escape system, and the a conical instrument module, which was 2.25 m long, 2.43 m wide with a mass of 2.27 tons and contained propellant, attitude control, power and the engine system. The Vostok-3K version was the operational version after the Vostok-1KP and Vostok-1K prototypes. After the instrument module performed the braking burn at the end of the mission, it was jettisoned. The spherical capsule reentered with passive attitude control provided by the mass distribution in the capsule. When the capsule reached a height of 7000 m, the cosmonaut was ejected and descended separately from the capsule via parachute, while the capsule landed also by parachute. The reason for this was that, due to the lack of landing braking rockets or airbags, the Vostok descent module made an extremely rough landing that could have left a cosmonaut seriously injured. If the retrorocket failed, the spacecraft would naturally decay from orbit within 10 days and the cosmonaut was provisioned with enough food and oxygen to survive until that time. The ejector seat would have also be used in case of a malfunction of the launch vehicle, but it became only available after a flight of 20 seconds, otherwise the ejector seat would not have enough time to deploy its parachute. A total of eight Vostok 3KA spacecraft were flown, six of them with a human crew. The longest flight lasted nearly five days, and the last four were launched in pairs, one day apart. Originally seven more Vostok missions with durations of up to 10 days were considered, but these were cancelled in favor of the slightly improved Voskhod-3KD and Voskhod-3KV versions.